Located between Paris and Disneyland Paris, 100 metres away from Neuilly Plaisance RER station, Milton Hotel offers rooms with a flat-screen TV, Canal+ channels and free Wi-Fi. The hotel features air-conditioned rooms and a wide range of services such as a 24/24 front desk and a free private car park. 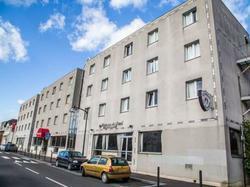 The Milton Hotel is set in an ideal location to visit Paris and Disneyland Paris. Whether you are on a business or leisure trip you will appreciate the easy access, comfort and prices the hotel features. Adjustable seminar rooms that can accommodate up to 80 people available. Nearby the river Marne, enjoy a boat ride or a stroll along the lovely Bords de Marne. During the summer the area offers all types of water activities and angling. Close by you will also find a green area with a children's playground. - Take the A4 towards Paris and take exit 5 (Fontenay, Bobigny, Le-Perreux). - Take the A86 towards Fontenay, Bobigny, Le Perreux, Lille and then choose exit 19 after the tunnel. - Head towards Chelles, Le- Perreux on the N34. Make a left before the RER bridge at the 8th traffic light. - Drive beside the Seine towards the East. - Take motorway A4 towards Metz and Nancy and then the A86 towards Fontenay, Bobigny, Le-Perreux, Lille. - Take exit 19 after the tunnel and follow the directions for Chelles, Le- Perreux on the N34. - Make a left before the RER bridge at the 8th traffic light. The hotel features a generous buffet breakfast served 7 days a week from 7:00h to 10:00h . Room service is available for breakfast, lunch and diner. Please note that the property is currently undergoing renovation works. This air-conditioned family room has a flat-screen TV with satellite channels. Decorated in a modern style, the rooms have air conditioning, a flat-screen TV and tea and coffee making facilities. The private bathroom includes a bathtub or shower.